Ohio News Network is a Columbus, Ohio cable television station. ONN News Director Greg Fisher acknowledged using the video news release, and said, "There should have been proper disclosure on the screen." Although such materials can have a place when used appropriately, Fisher said, the cable-news network's policy is not to use them without informing viewers of the source. "It is worth noting that the information did air on a lifestyle, non-news portion of a program called Technology Tuesday," he added. "But, again, we should have been employing proper disclosure on screen." 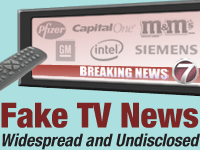 Tim Feran, "Newscasts take flak for flackery: Corporate ‘news’ releases shown without attribution by ONN, WSYX, report says," The Columbus Dispatch (Ohio), April 11, 2006. This page was last edited on 11 October 2017, at 20:39.